UPDATED: Wed., Aug. 15, 2018, 10:15 p.m.
His coaching career in its genesis, 26-year-old Eastern Washington offensive line coach Jase Butorac has already lived a charmed life at the position. The former center lined up between some of the Eagles’ finest behemoths in an impressive five-season stretch (2010-2014), winning three conference titles and a national championship. 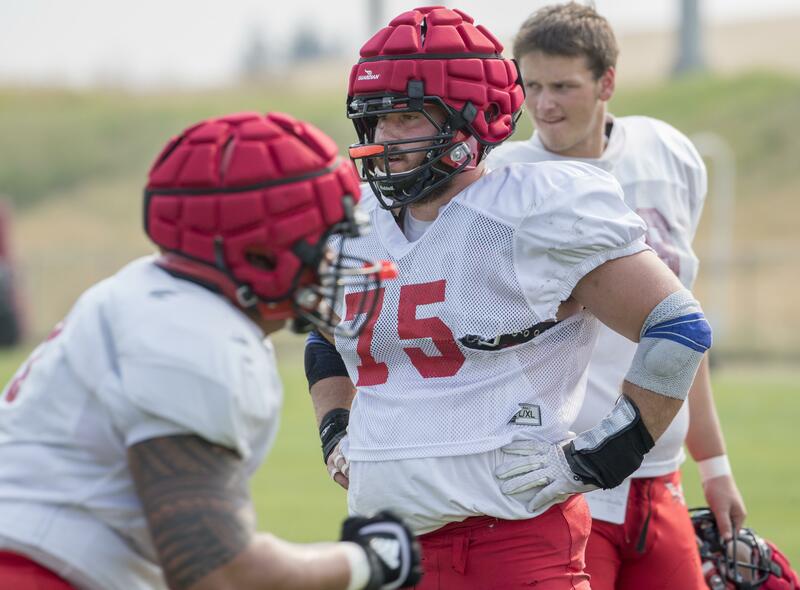 Butorac has been in Cheney since exhausting his eligibility and has since helped develop a few decorated linemen. In his nine years at EWU, he believes this year’s group is the deepest. Five of EWU’s starters have collectively registered nearly 100 starts in their careers. A few more earned starts or significant reps due to a rash of injuries in 2017, a season in which EWU still ranked fifth in the country in yards per game (477). As big bodies shuffled around the last three seasons, All-America center Spencer Blackburn has been a constant presence. The four-year starter and team captain likes the depth and versatility of this group. Tristen Taylor (6-6, 235) returns after starting10 games at left guard. Chris Schlichting (6-5, 295) started two games at left tackle before starting the last nine games at right tackle after Kaleb Levao went down with a season-ending injury. When right guard Matt Meyer (6-5, 315) went down with a season-ending injury early last season, Jack Hunter (6-4, 295) came in and started the next eight games. Now, on the preseason depth chart, Meyer and Hunter are listed No. 1 at right and left guard, respectively. Nick Blair and Will Gram add depth to the guard position, while Levao, Beau Byus and Matt Shook are versatile commodities at tackle. Blackburn said Levao looks even better now than when he started a year ago. Butorac said it was a “good problem” having over 10 capable bodies – including five redshirt seniors and four redshirt juniors – to tinker with. Meyer, who is coming off two elbow surgeries, likes the idea of rotating experienced players. “If you go down, someone can come in and know what they’re doing and you don’t have to think to yourself ‘Am I better at 70 percent than someone else’s 100?,’” Meyer said. Improved run blocking has been a point of emphasis in camp, along with keeping All-America quarterback Gage Gubrud protected. Blackburn said EWU has also improved in size, as a few undersized linemen put on the appropriate pounds in the offseason. Published: Aug. 15, 2018, 4:10 p.m. Updated: Aug. 15, 2018, 10:15 p.m.